In more and more deserts on earth electricity power plants are being built that generate a large amount of electricity by means of thermal solar energy. In one set-up hundreds of flat movable mirrors are mounted on the ground. They reflect the sunlight into a so-called sun tower in the centre of the plant. There is a large kettle in the top of the tower in which steam is produced. With this steam, electricity is generated through a steam turbine and a generator which can be beneficially used at a large distance (see image 22). With this type of sustainable energy, power is developed by aligning many mirrors and pointing them at the same target: the focal point in the centre. Similarly, a group of spiritually aspiring people, working together in a harmonious way, develops an enormous power source that contributes to spiritual awareness and renewal on a global scale. Everyone in whom the spirit-spark in the centre of the microcosm is awakened, reflects the light of the spiritual sun. In those who, from an authentic spiritual tradition, tune in to the spiritual sun, the tree of life will grow and there will be a time that it will bear fruit so that other people can be nourished by it. Then the soul will become active in ever more people, as a clear, flaming fire that will provide the strength to undertake the inner journey. If the pilgrims on the path of renewal of spirit, soul and body will regularly withdraw into their inner castle, they will be able – in a unique way – to live so spiritually creative that their lives will contribute to the implementation of the divine creation plan. The septenary of new powers will brighten their dull and dim inner mirror, enabling them to perform their sacred work for world and mankind in group unity with the light of the spiritual sun. The question may arise: would not it be better to go the spiritual path on my own? Is not all that I need for my inner journey generally available? Is not it better to – in a symbolic sense – place a solar panel on the roof of my house so that I will be self-supporting, and not dependent on others? Such questions exemplify your initiative and your autonomy. They show that you have developed into a conscious individual and that the involution of the microcosm that you live in, has been completed successfully. Thanks to the help of creative hierarchies, after a long development process over many centuries, an integrated personality has developed which can relatively quickly turn into an autonomous person, inspired by the spirit, able to be servient to everything and everyone. 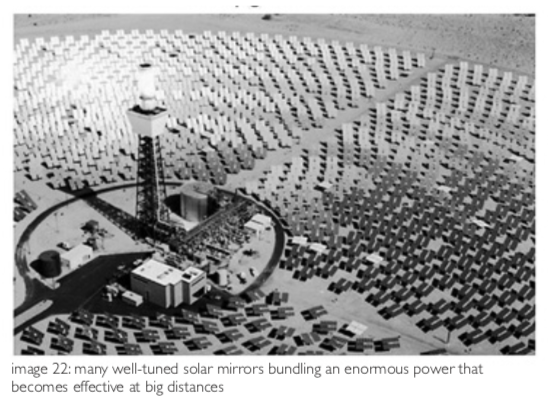 In the sensory perceptible world, it is not possible that a mirror of a large solar energy plant in the desert could at the same time be a solar panel on your house. In the world of the soul this is indeed possible – in a symbolic sense. More than that, it is urgently needed. Everything suggests that collectivity and individuality are both needed and that the one cannot do without the other. You can be both: the mirror in the large solar energy plant as well as the solar panel on your house. The miracle of the cosmos has been created and is maintained from moment to moment by the activity of countless autonomous angels, intelligently and harmoniously working together at many levels. And this can also be said about the miracle of the microcosm: man too, was able to develop by virtue of the unselfish cooperation between hosts of angels. The human society has been created by and maintained from moment to moment by the activity of many autonomous people, working together at all kinds of levels and receiving guidance from above for this. This cooperation among people does alas not always happen intelligently and harmoniously, but it is certain that the ideal will become reality in the distant future as a result of a sacred inspiration in people. Now the days will come that the visionaries foresaw in the ether. The flaming triangle of ideality, vitality and reality is erected and prophesy will now prove what has long been said under a veil. The classical Rosicrucians knew this and they therefore began their first manifesto from the year 1614 with the following words, which are still highly topical in the 21st century. ‘Seeing that the only wise and merciful God in these latter days has poured out his mercy and goodness over mankind so richly that we thereby attain more and more to the perfect knowledge of his son and of nature, we may justly boast of the happy time wherein he has not only made us discover that half of the world which was heretofore unknown and hidden, but also made manifest unto us many wonderful and never heretofore seen works and creatures of nature, and moreover has raised highly enlightened men of noble spirit who have partly restored the degenerate and imperfect arts, so that ultimately man might understand his own nobility and worth, and why he is called microcosm, and how far his knowledge of nature extends. Today science, religion and art have developed to unprecedented heights, but they are reaching their limits. The inner knowledge of the Christ power, that was made available for mankind through Jesus, has been revealed to a rapidly increasing number of spiritual seekers. More and more people are beginning to realise that they are a temporary manifestation within an immortal microcosm, in which enlightenment and spiritual wealth may gradually be de- veloped. Knowledge of the mysteries, in earlier days meticulously hidden within mystery schools, is now within the reach of every developed human being with access to the internet. Apart from all the negative aspects entailed by the internet, as pointed out in chapter 14, we may at the same time regard this as a fantastic instrument to clarify to people how true lasting happiness may be attained; how they can become enlightened by the spiritual sun that encompasses everything and everyone and is simultaneously present in everything and everyone. Jan Amos Komensky, from Moravia, in today’s Czech Republic, better known under his Latin name J.A. Comenius (1592-1670), foresaw in 1641 already the arrival of such a universal medium, in which everyone would be able to find all that is needed for experiencing ‘bliss’, as he called it. We can justifiably call Comenius a universal man, or uomo universale. The flaming triangle of knowledge, love and action illuminated his whole life, which was far from easy and comfortable. Comenius was a theologian and conceived a theological-philosophical system with the objective to improve the world by educating man to a free being, able to take his own decisions and capable of voluntarily choosing for the good. He renewed pedagogy, introduced resource-based teaching and wrote several textbooks. He furthermore engaged in, among other things, cartography, music and medicine. In his book ‘Via Lucis’ (The Way of Light) – which Comenius finished in 1642 in London but was only published in 1668 when he was living in Amsterdam – he described, amongst others, seven ways knowledge was acquired through the times. In the course of history, these seven ways of the intellectual light have been developing one after the other in the given sequence. ‘And so we wait, along the way of the ages until now, and after hav- ing traveled these six ways of the light, now the seventh. And because we have come here along an ascending road, the next is also a higher stage. This purports – how can it be different now with all the traffic through the ages because of the art of printing and between the peoples by their seafaring – from all light sources that have been undiscovered to date, that one great light arises to the general use of humanity. That, in fact, all that was hereto individually and for one’s own good, considered, sought, found and revealed by God and taken possession of in our, or in another century by this or that people, culture, family home,- that this is now given to the whole world in its fulness. Might the internet not just be the book of nature that is mentioned in the preface of the Fama Fraternitatis? The worldwide web is a repository of almost everything that mankind has produced, from the very worst to the noblest of things. So, this digital reflection of mankind is certainly about nature in the broadest sense of the world, but as it concerns a repository of countless visions, which are often in conflict with each other, it cannot serve as a guideline for all arts. It is, however, possible that such guidelines are studied via the internet. It is perfectly possible nowadays to hold meetings via the internet. That is very useful, as all kinds of costs and hassle with regard to traveling and material facilities can be prevented in this way. Yet it is important to realise that there is much more power in meeting physically, in particular if spiritual-religious meetings in a temple are concerned, because the group body will thus bring about a greater outpouring of force in that case. ‘Those are closest to us and the most like unto us who make the Bible the guiding principle of their lives, the centre of their striving for knowledge, and who treat it as a compendium and summary of the whole world. […] Since the beginning of the world man has not been given a greater, more admirable or more beneficial work than the Holy Bible. Blessed is he who possesses it; more blessed he who reads it, most blessed is he who becomes thoroughly acquainted with it; while he is most like unto God who understands it as well as obeys it. A book of nature can also be a construction that has clearly been inspired by the world of the soul. Think of the impressive pyramids in Egypt and the medieval cathedrals, which are rich in universal symbolism, and are reflecting cosmic laws in their dimensions, proportions and structures. Some master builders of the cathe- drals were initiates and possessed extensive esoteric knowledge. Certain paintings, among which ‘The garden of earthly delights’ by Hieronymus Bosch and the Kabbalistic Lehrtafel of Johann Friedrich Gruber, can also be considered books of nature. And what about musical masterpieces like Die Zauberflöte by Wolfgang Amadeus Mozart, The Messiah by Georg Friedrich Händel and profound works of Johann Sebastian Bach? Bach once said that the ultimate goal of all music should be to praise God and sooth the soul. Studies by the musician Kees van Houten show that in certain compositions the name Bach is transformed into the name Christian Rosencreutz and that a Rosicrucian motto can be discovered in them as well: ‘While living, I made this compendium of the universe my tomb’. Comenius was very familiar indeed with the manifestos of the Rosicrucians in southern Germany, in which Christian Rosenkreutz is the central figure. He even corresponded with the author, Johann Valentin Andreae (1586-1654), on a potential cooperation to jointly spread the philosophy further in the world. The once so passionate circle of friends of Tübingen however, of which Andreae was a member, had fallen apart, partly as a result of the Thirty Years’ War. Due to all kinds of setbacks, Andreae did no longer have the vitality and resilience to further cooperate with the plans of Comenius. Scholars have sometimes called the book Via Lucis the Fama of Comenius, because it is an attempt to reformation, in its deepest essence identical to the one of the Rosicrucians. Comenius dedicated his book Via Lucis, which can – like the Fama – quite rightly be called a book of nature, to the Royal Society, an association of great scholars in England. We could say that Comenius had taken over the torch of inspiration from the Rosicrucians and carried it through Western-Europe. Comenius was a minister and later a bishop at the Moravian Unity of Brethren. The members of this tightly-knit and sturdy religious community cooperated harmoniously, based on Christian ideals in accordance with the tradition of the Bohemian reformer John Hus (1370-1415). Hus (Czech for goose) was burned for heresy in 1415, in Prague, and on the stake where he was being executed, he shouted out: ‘They will roast a goose now but a swan will rise from its ashes.’ Later on, people remembered these words of Hus and they believed that they referred to Martin Luther. That is how the swan became the symbol of Luther and the Lutheran church. A flock of geese, by the way, is a splendid symbol for cooperation. In 1972 Robert McNeish wrote a famous text about this, which is still often used in courses on leadership and cooperation. Why the goose is regarded as a symbol for the soul has already been extensively explained in chapter 13 (essay 4). In autumn wild geese jointly travel to warmer areas, to spend the winter there. In the same way a spiritual group travels in the direction of the world of the soul. They are working on themselves, while maintaining their inspiration by exchanges within the group. Geese fly in a V-formation because every goose that flaps its wings thus creates an uplift for the birds that follow. 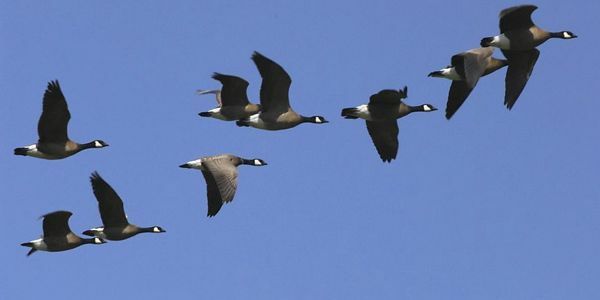 By flying in a V-formation, the group only uses 72% of the energy that would be needed if the geese would fly on their own. Analogously, people who jointly go in a certain direction in group unity, will reach their goal earlier and easier, as they can use each other’s driving force. When a goose falls out of formation, it suddenly feels the drag and resistance of flying alone. It quickly moves back into formation to take advantage of the lifting power of the bird immediately in front of it. If we have as much awareness as these geese, we stay in formation with those headed where we want to go. We accept help and in turn help others. The leading goose in the V-formation has the hardest job, of course, as it has to overcome most of the air resistance. If the front goose gets tired, it rotates back into the formation and another goose flies to the point position. If we translate this towards the cooperation between people, we can say that it is advisable to alternate difficult tasks and share the leadership. Just like geese, people are interdependent of each other’s unique knowledge, skills, gifts and talents. The geese flying in formation honk to encourage those up front to keep up their speed. From that observation we can learn that we have to take care that our honking is stimulating others and that we appreciate and encourage others to reach their full potential. Teamwork pays off, and even more so where authentic spiritual- ity is concerned. We all know the force of cooperation, but do we also understand the deeper background of it? There is synergy of course, the whole is more than the sum of the parts: 1+1=3. Miracles as such do not matter. The only thing that matters is their source, which is far beyond evaluation. That is to say: miracles as such are not the most important, as the only real value is in the source that miracles come from. That source is so great and special, that no human being can determine its value. Miracles occur naturally as expressions of love. The real miracle is the love that inspires them. In this sense everything that comes from love is a miracle. Whenever love is given, miracles arise. The basis of the miracle is love and love is the only true miracle. All miracles mean life, and God is the giver of life. His voice will direct you very specifically. You will be told all you need to know. This means: all the miracles that occur serve the objective to maintain life and God is the one who gave life. His voice will guide you in a very special way and you will be told everything you have to know. Miracles are habits and should be involuntary. They should not be under conscious control. Consciously selected miracles can be misguided. This means: love causes miracles and that is why love should be a habit. You should give love without being conscious of it. You need not think about love, for if you think first before giving your love, your ego might step in. Miracles are natural. When they do not occur, something has gone wrong. This means: miracles should occur naturally. Miracles are everyone’s right, but purification is necessary first. This means: you can only give and receive a miracle when your heart is pure. Miracles are healing because they fill a lack of something; they are performed by those who temporarily have more, for those who temporarily have less. This means: miracles have a healing effect because they provide what is missing. They are performed by people who temporarily have more love for those who temporarily experience less love. We can go even further here than the course in miracles and make a remark about the source. The miracles in question indeed originate from God, but this does not mean the Highest of All, as it is impossible to know and experience him. Muslims are quite right in saying that it is not possible to get into a personal relationship with Allah, because he is exalted above all. Yet, we can make contact with the divine world, as human beings and experience the divine. That is possible by virtue of forces and entities that can be considered as concrete manifestations of holiness and can act as intermediaries. If miracles occur, we owe it to such an activity. If people in a team work together from pure intentions, their soul forces will work together too. And if a group of spiritually aspiring people jointly go an authentic spiritual way, a new in- spired life field will be created for that group, which will increase in power as the group progresses. In this respect the term living body has been used. In the last centuries we have seen much dissension between all kinds of religious and spiritual groups. Now many churches stand empty and organizations are shrinking or disappearing. The need for cooperation in the field of religion and spirituality is felt more and more. There are all kinds of initiatives to instigate a new zeal. ‘The gleam of a new reality appears among the ruins of what will soon be the past. A new possibility is approaching. On the destroyed hope and annihilated self-assurance of the intellectual public, a new longing will soon be established. Mockery, laughter and slander will soon disappear from their faces and at last the will listen to the esoterics. Then the sons of the prophets will speak to you of the omnipresent divine wisdom, which is nearer than hands and feet. They will tell you how this wisdom is obtained. They will urge you on to a new way of life, a blood-renewing way of life, born of the love power of Jesus Christ. Then you will discover that a pure white flower will begin to reveal itself in your being – the mystic lily, the lotus of the Eastern seers. This is the entering of the holy halls of abstract thought, where the wisdom of God, the universal knowledge, can be absorbed in the form of force. It is a walking in the light, as He is in the light. In this way an immeasurable divine knowledge, a divine philosophy, unfolds before the pupil, the philosophy of magical knowledge. On this basis, at this gate of eternity, all those who are called to a new intellectuality, all lovers of true wisdom, will be united. At this gate to eternity there will be thinkers, poets and builders, people who are called from all branches of science, art and religion. And refreshed at the one source of Original Wisdom, as brothers and sisters linked to each other in one chain, they will set to work for the majestic unfolding of their talents.